Once upon a time, two brothers who lived on adjoining farms fell into conflict. It was the first serious rift in 40 years of farming side by side, sharing machinery, and trading labor and goods as needed without a hitch. One morning there was a knock on John’s door. He opened it to find a man with a carpenter’s toolbox. The older brother had to go to town, so he helped the carpenter get the materials ready and then he was off for the day. The carpenter worked hard all that day measuring, sawing, nailing. About sunset when the farmer returned, the carpenter had just finished his job. The farmer’s eyes opened wide, his jaw dropped. It was a bridge — a bridge stretching from one side of the creek to the other! A fine piece of work handrails and all — and the neighbour, his younger brother, was coming across, his hand outstretched. At Christmas God came down to build the ultimate bridge with us! The birth of Christ brought God to us; the cross of Christ brought us to God. 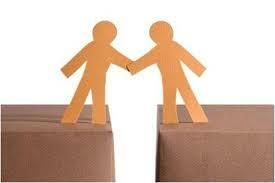 This New Year… let’s build relationship bridges! Whether it be with members of our family, our neighbours or the people in our midst that are different from us....where can you build a relationship bridge? This Sunday, on the eve of 2018, we will conclude our 4 part series entitled the Gifts of Christmas. Please join us! Be sure to remember the secret phrase: Let’s build relationship bridges! Be sure to yell it out when I ask… you won’t be disappointed!